bebop spoken here: Jeux de Mots! 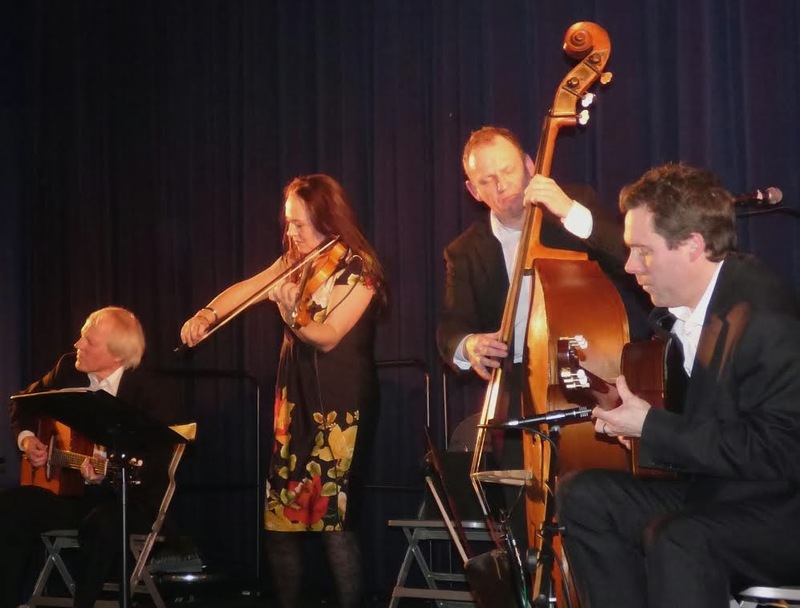 Djangologie @ Bishop Auckland Town Hall. Wednesday February 12. Jeux de Mots! 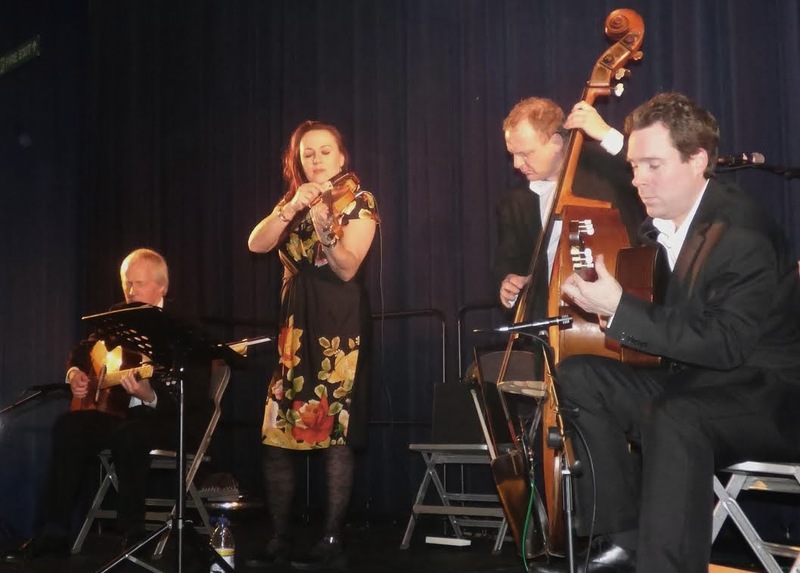 Djangologie @ Bishop Auckland Town Hall. Wednesday February 12. Mick Shoulder (bass), Emma Fisk (violin), Giles Strong (guitar) and James Birkett (guitar). It began inauspiciously: had we encountered three witches and a cauldron between car-park and Town Hall, I’d not have been surprised! Even inside, the wind howled and thrummed in the rafters and the curtains behind the stage wafted ominously! It was a good turn-out though and from the off the audience, having unwrapped more layers than I’ve seen since returning from a visit to Estonia, was rapt – “too rapt” during Dinah, according to Mick! He urged applause and, solo by solo, they “un-rapt” to the extent that he seemed almost to “tut” after one unseemly bout of premature Mick-adulation before he’d finished his solo! “There’s no pleasing him,” said Emma. But we were pleased by Douce Ambience in which Giles “did something contrapuntal” (it’s legal in Bishop!) and by Feuille d’Automne and Nuages. During the quiet, melancholic coda to this last, the wind made its presence felt as “fifth member” of the band: for the most part, fortunately, the strumming guitars and tapping feet managed to drown it out. Music conquers all? When introducing the players Mick clarified his rhyming references to Emma as the “ship’s porcupine,” which explanation I will not go into here. I did notice, however, that by the second-half intros she was simply “Miss Emma Fisk”. Simply brilliant on her solos, if you ask me, as indeed were they all at various points in the gig. Many of the tunes were familiar to me: Hun o Pani Naschella; Songe d’Automne; Artillerie Lourde; Minor Swing and the breakneck Stompin’ at Decca. Later there followed: Sheikh of Araby; Veish a No Drom; Mira Prau (?) and Les Yeux Noirs. As well as these old friends, there were at least two which were entirely new to me: Cigano Bolero and Blues for D.R., both Mick originals and both very welcome additions to what is already a great repertoire. Cigano (= gypsy in Portuguese) Bolero had Giles Strong taking the lead while James Birkett strummed a soft Latin rhythm and Emma Fisk’s violin was softly lyrical. A beautiful tune! Blues for D.R. had a slow opening such as Django might have produced after a sabbatical in the Delta before going up-tempo in another wind-cheating blast. And, through the soothing encore, Dans mon Endroit Tranquil, the wind was still ironically vocal but we scarcely noticed, rapt still (O.E.D. - 1]completely fascinated 2] filled with an intense and pleasurable emotion). My friends, guitar-enthusiasts both, bought CD’s before they left – with only a few hints from Mick and the “Big Lad” on the door! It really was that good.